A few weeks ago, I posted about Mother’s Day presents for crafty mamas. I had so much fun thinking about the ultimate gifts for moms who love to create! But I was so surprised when I heard over and over about how great a subscription box would be to receive as a gift. So I got right to work and found a bunch of other awesome subscription boxes for creative kids and adults! This post contains affiliate links. If you click on the links below and make a purchase, I may receive a small compensation to help me finance this site and keep coming up with awesome tutorials and tips! There’s no cost to you and I only ever include links to companies and products that I trust and work with on a regular basis. Subscription boxes are a great way to inspire creativity for crafters of all ages. Many have options for one month or more, and sometimes there might be choices for different themes or projects. Sometimes you can even purchase past boxes for extra fun! Home Made Luxe is the box company that I featured in my post for moms. They sent out a hexagon cork board project a few months back that was adorable! Order an award-winning box from Green Kids Crafts for the little wonderer in your life and they’ll receive up to 8 projects! Designed for children ages 3-10, these thoughtful activities are meant to foster creativity and a love of STEAM (science, technology, engineering, arts, and math). Smart Art sends its subscribers a monthly project based on a different medium. 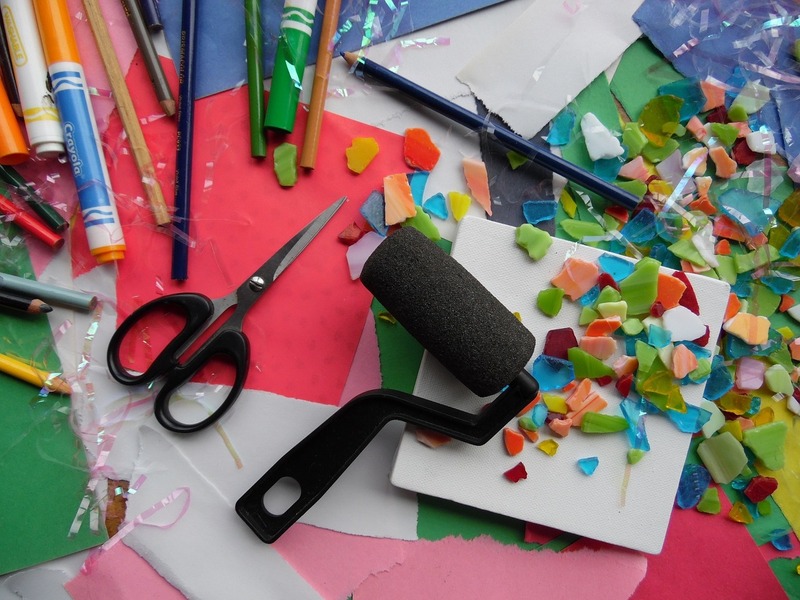 They mail along all the tools you’ll need to explore a new art form, such as street art, watercolor pencils or mosaics. This one is for the crafter who just wants to do it all! This one is really special! Outside the Box by Cheeky Days is so much more than just a craft box. Their mission is to enhance children’s creativity through curated projects, books and wearables, while also focusing on community and giving back. They have such a strong mission. Everything they do coincides with values I’m working hard to instill in my own children. Ann Williams Monthly Craft Box has options for crafters from elementary school age all the way though teen years and into adulthood! They boast that no two boxes are alike, so you could be surprised by amazing projects for years! If that wasn’t awesome enough, use the code CRAFT50 to save 50% off your first monthly box when you sign up! If you’re looking for a really specific box, try Cratejoy! They have boxes for every interest under the sun! Plus, if you have an the perfect idea for a new subscription box business of your own, you can get started today at Cratejoy! Cratejoy is the internet’s largest subscription box marketplace, where your brilliant box can get in front of tons of buyers. A crafty subscription box would be such a wonderful gift to send to a friend or loved one, but why not gift one to yourself, too? Or send a few to some creative kiddos you know to inspire them all summer long! I love the idea of sending subscription boxes to creative kids and adults, and there’s just so many options. Leave a comment below to let me know of any that I’ve missed! An art school grad and self-taught quiller, I'm the hands and brain behind The Papery Craftery site and shop. I love finding new papercraft techniques and artists! I don’t know if I could even choose one of these! I would definitely love a craft subscription box – I love doing projects and I especially love it when all of the supplies I need are all in one place, like a kit! I couldn’t choose just one either! These all look so fun! I love subscription boxes. Who doesn’t love getting mail?! I absolutely love these subscription boxes! They’re so cute, and look super simple to do with children as well. I think they’d be so fun to send as gifts too. Thanks so much for stopping by, Rachel! Love your blog. These subscription boxes are so interesting. Saving this so I can browse the different boxes at my leisure. Thanks so much, Amanda! I hope you find one you can use! I had no idea there were so many craft subscription box options! These look like so much fun. There are so many! While I was researching, I found tons of great gift ideas for my non-crafty peeps too. I’m relatively new to the crafting world. Mostly painting, spray painting and creative journaling for now. These are lovely! But I’m afraid it may turn me into a craft hoarder LOL. I’m going to have to check some of these out! My kids love being crafty! Awesome, Alex! I hope they have loads of fun! This is so fun and would be an amazing gift! I think so too. They could even be great for a family to share! I have never gotten a subscription box, but I might start. This looks great. Amazing boxes, My daughter love being crafty! Enjoy weekend!!! Hi there! I’m Meredith, art school grad and mama of two awesome and incredibly energetic littles. I fell across paper quilling by chance and fell in love with all the amazing things paper can do! Follow along as I roll tiny quilling creations and I promise I’ll teach you everything I know! Please follow & like The Papery Craftery to catch all the latest! If you click on the links and make a purchase, I would receive a small compensation to help me finance this site and keep coming up with awesome tutorials and tips! There's no cost to you and I only ever include links to companies and products that I trust and work with on a regular basis. All posts with affiliate links are clearly marked. The Papery Craftery blog is a participant in the Amazon Services LLC Associates Program, an affiliate advertising program designed to provide a means for us to earn fees by linking to Amazon.com and affiliated sites. Save some money on your craft supplies! I hope you're inspired by my quilling! Feel free to use my designs as gifts or for your own personal use. And I'd love any sharing of my photos and projects! All I ask is that all photos remain unaltered and link back to the original post, and please do not attempt to sell my any quilling created from my designs as your own work. Like The Papery Craftery on Facebook to hear about shop news, coupon codes and giveaways!